We hope all the participants have enjoyed the contest. A short clip of overview of the contest is available here. Our special thanks goes to MikeMirzayanov for perfectly hosting our elimination round on Codeforces. We'd also like to thank ivanromanov for his great coverage of the event. We'll do our best to put the problem-set in the gym as soon as possible. Since the final round has finished, we'll start shipping the T-shirts of elimination round winners in 10 days. Bayan 2012/13 Elimination Round T-shirt winners! So you were in the top 100 of Bayan 2012/13 elimination round? Congratulations! We're just about to start shipping the T-shirts. Unfortunately, some of the users had not provided the required information in their profile. If you are one of them, please send your detailed contact information and T-shirt size to contest (at) bayan (dot) co (dot) ir in the next 48 hours. 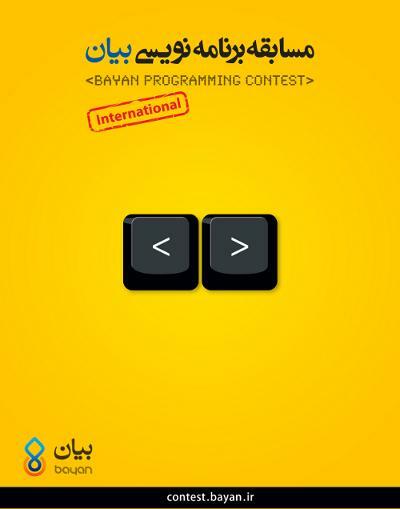 Thank you all for participating in the elimination round of Bayan Contest. The final results are available. We had more than three thousand registered users for the contest on Codeforces and one third of them were able to solve at least one problem. 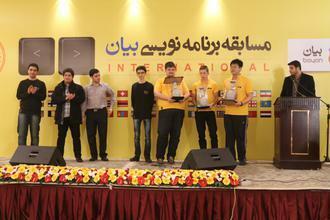 In the meantime 1100 Iranian contestants participated in our local contest and half of them solved a problem. We tried hard to prepare a challenging-yet-fun problemset. The problem "241G - Challenging Balloons" was inspired from a real story! The problem described in the story was used in CEOI 2011 (Task Balloons), and the provided algorithm was the author's solution during that contest — which got the full mark indeed. According to statistics, "241D - Numbers" was the hardest problem. A tricky approach to the solution is to ignore large inputs and solve the problem for small values of n. You may observe that it is possible to find the demanded subset within a small part of input. During the contest, no one solved all the problems but there was at least one successful attempt for each of them. We hope you enjoyed it all! As stated before, Top 100 contestants will be receiving T-shirts. So, update your contact information and T-Shirt size in your Codeforces profile. We'll start sending the prizes as soon as possible. The winners will receive invitation letters — to the on-site event — soon. If you are one of them make sure your contact information is up-to-date. Congratulations to all the participants, specially the winners. See you in Tehran! Time for Bayan Programming Contest 2012/13 — Elimination Round. The problemset has been prepared by Bayan employees. We've tried our best to make it interesting, competitive and a little-bit different! We'd like to thank Mike Mirzayanov (MikeMirzayanov) and Gerald Agapov (Gerald) who helped us during problemset arrangement process. 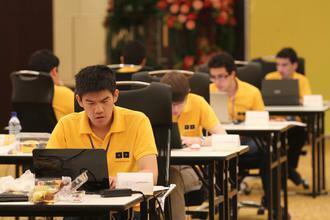 The contest is individual and will be held with ACM-ICPC rules. It will be having English statements only. Also, it will be rated for Div-1 contestants, but we expect Div-2 participants to enjoy it as well. This round will be a 3hr round with 7 problems to solve. Just like most of ACM-ICPC contests, problems are not supposed to be sorted in order of difficulty. Also, the registration will be open until the end of contest, so be sure to double-check the timing. Top 20 participants will be invited to the onsite event — Tehran, and Top 100 will be receiving T-Shirts. More details about the prizes is explained in our previous blog post. Just to emphasize some rules, avoid participating with more than one usernames. Also, you should not collaborate or contact anyone about the problems. Because of unusual calculation of rating for this contest. The rating will be updated with delay. Server time: Apr/22/2019 20:16:07 (e1).